Should I be worried about my family’s exposure to mercury? How can mercury affect me and my family’s health? What are the cleanup action levels? Mercury is a metal that is a shiny, silver-white, odorless liquid at room temperature. Its unusual properties of being a liquid at room temperature, forming round beads when spilled, and shiny appearance make mercury very attractive and inviting; however, even exposure to small amounts of mercury can cause health problems. Mercury can be found in thermometers and some electrical switches and small amounts can be found in compact fluorescent light bulbs. Mercury has also been used in barometers, batteries, car switches, dental fillings, fungicides and some herbal and religious remedies. If not properly encased, mercury can evaporate and release harmful mercury vapors. Should I be worried about my family's exposure to mercury? Mercury occurs naturally in the environment. Because of this, everyone has been exposed to some level of mercury through the air we breathe, water we drink and food we eat. However, these natural levels in the environment are far below the levels considered a health risk. If mercury is spilled, the vapors released can be a health risk. When small amounts of mercury are swallowed, less than 0.01 percent will be absorbed by the body; however, when mercury vapors are breathed in, about 80 percent of the mercury enters the bloodstream. A few drops of metallic mercury can create enough vapors to cause a health risk. The longer an individual breathes these vapors the greater their risk becomes. Replacing old mercury containing products with mercury free alternatives. If you are unable to replace these products, remove them from areas where they can be easily broken. If you think you have been exposed to high levels of mercury, consult your physician. Your physician can have blood and urine samples tested to determine if you have recently been exposed to elevated levels of mercury. Mercury mainly affects the brain and kidneys. Young children whose brain and kidneys are still developing are more sensitive to mercury than adults. Whether the exposure is short- or long-term, similar neurological effects occur with symptoms intensifying as the concentration of mercury and the duration of exposure increases. In water and soil, microorganisms and natural processes convert mercury into methylmercury. Fish and other organisms can quickly take up the methylmercury. Methylmercury bioaccumulates up the food chain, so larger predator fish tend to have the highest levels of mercury. In most instances and for most people, the health benefits of eating fish outweigh the potential health risks from mercury. One meal per month: walleye, largemouth bass, spotted bass, and smallmouth bass greater than 12 inches in length. One meal per month: flathead, channel, and blue catfish greater than 30 inches in length. One meal per week: all other sport fish, because all fish have various levels of mercury. In the absence of local advisories, consumers are advised to restrict fish consumption of locally caught fish to one meal per week. For more information go to: www.epa.gov/waterscience/fishadvice/1-meal-per-week.pdf. For information on mercury in fish and fish advisories in Missouri, visit the Department of Health and Senior Services Fish Advisory. Mercury can be very difficult to clean up. It is extremely hard to get out of clothes, furniture, carpet, floors, walls and other porous items. Once spilled, mercury beads can scatter and settle into nooks and cracks in the floor. 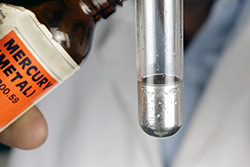 Many standard techniques for cleaning up a liquid spill (like using a mop or towels) should not be used to clean up mercury; in fact, this is likely to spread the mercury out and create more vapors. If mercury is not properly cleaned up, it can remain for months or years and cause an ongoing health risk. The Missouri Department of Natural Resources Cleaning Up A Mercury Spill with cleanup instructions for small mercury spills such as a broken household thermometer (about 1 gram), thermostat (about 3 grams), or compact fluorescent bulb (about 5 milligrams). For larger mercury spills, contact the Missouri Department of Natural Resources 24-hour Spill Line for technical advice and assistance at 573-634-2436. Do not wipe with a cloth or towel. Mercury is not absorbent, so this spreads the mercury and breaks it into smaller pieces. Never use a household vacuum cleaner or shop vac to clean up mercury. This makes the problem worse by creating more mercury vapors and contaminating the vacuum. Do not use a broom. This scatters the mercury droplets and makes them harder to find. Do not pour mercury down the sink, toilet or drain. Mercury is 13.6 times heavier than water and may get trapped in the drain where it may continue to emit harmful vapors. Never place mercury contaminated clothes in a washing machine. DHSS recommends an action level of 1 mg/m3 of mercury for all properties including residential homes, schools, retail businesses, vehicles and other locations. This action level is based upon DHSS’s adoption, in part, of the joint EPA/ATSDR National Mercury Cleanup Policy Workgroup’s document “Action Levels for Elemental Mercury Spills”. This document recommends 1 mg/m3 of mercury for residential properties and has higher action levels depending on the location of the spill and other factors. However, DHSS has determined that one screening level for all locations would be more appropriate while higher screening levels could be determined on a case by case basis.